Made with your choice of Wood Finish or High-Grade Formica and stainless steel or brass cup holders. Available with "H" Type Legs, Chip Area, and Adjustable Levelers. 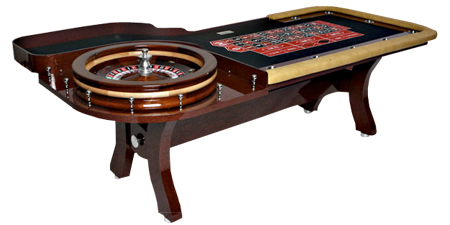 Deluxe Stationary Roulette Tables are available in 8 or 9 ft. lengths and can accommodate a 27" to 32" roulette wheel (sold separately). For additional information on our any of our Roulette Tables, please contact us at 1-800-233-0828. Feel free to browse our other Stationary Roulette Tables, Folding Roulette Tables, Precision Wood Roulette Wheels, and Roulette Supplies.